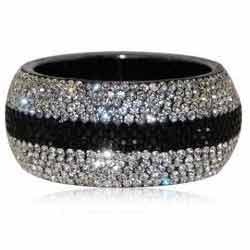 Crafted with perfection, we are engaged in manufacturing and supply of vast collection of Designer Crystal Bangle. our products are highly appreciated in the market for their glossy shine and smooth finishing. Our products are in huge demand by large numbers of clients. Moreover, product is available in very affordable price to our esteemed clients. Our entire range of products is highly demanded in domestic as well in international market. Our Fancy Crystal Bangles are beautifully designed and handcrafted to perfection. Metal shorts Crystal Bangles are embellished with brightness, crystals and beads with gold combination for an exclusive look. These are designed by our team of experts using bright colours & good quality crystals.